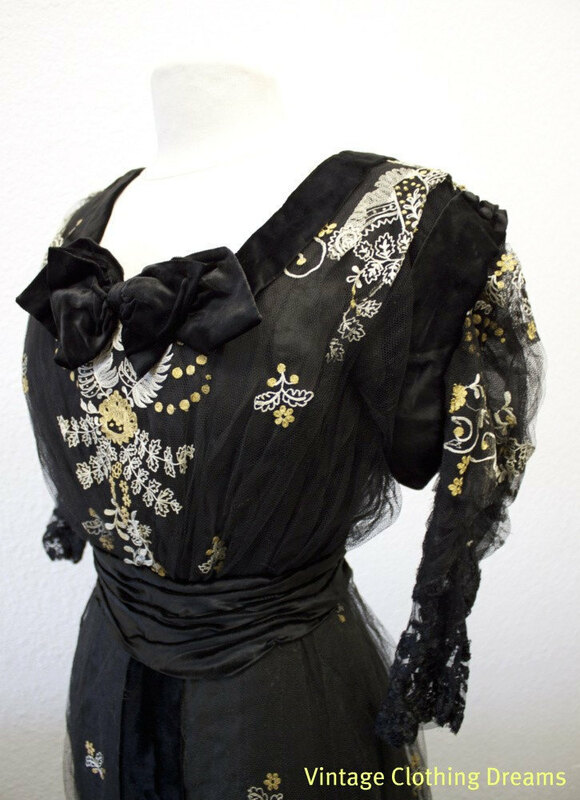 For the truly discriminate, I offer a one of a kind Edwardian Silk Lace Dress and Formal Gown made by Carraer Eastman of Providence Rhode Island, who created the type of dress that is meant to be worn by the lady who has exceptional taste. 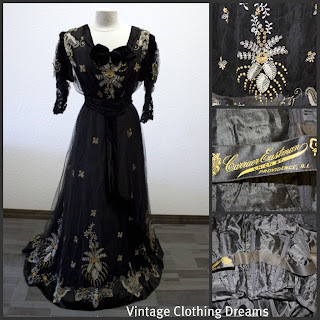 The gown is created with a silk blouse with a lace overlay. The top of the dress has a large velvet bow, accenting the exquisite lace centerpiece. The blouson front has layered shoulders, accented with velvet trim and buttons, with lace sleeves. 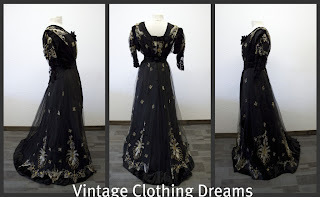 The waist is accented in more velvet, raunched to show off the corseted interior and slimming the gown. The skirt is also created with a silk skirt base and lace overlay. The underskirts are pleated silk with a silk overlay, approximately 3 flounces to keep the dust away from the lace overskirt. The formal skirt is made to be worn with a bustle, but can be worn without and let down for a small train. The interior corset stays and material shows little wear and the corseted portion is in excellent condition. The interior has silk sweat pads, still in good condition, plus a modesty panel in the front of the blouse. 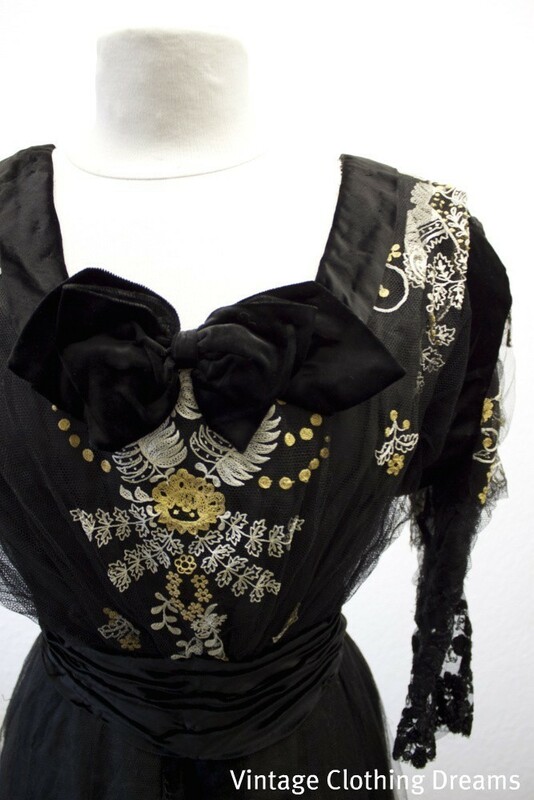 The back of the blouse also has a minor modesty see-through lace panel (very tiny), with a single hook overlay, but I can't seem to find the hook to match the eye amidst the black lace. The back of the blouse has small but standard hooks and eyes from top to waist, and the skirt has miniature hooks and eyes from waist down the back of the skirt, overlayed with a back velvet buckle. I purchased this dress approximately 15 years ago, but never wore it. I just took it out of the box for the photos only. Shoulder to shoulder, inside seams: 18"
Shoulder to shoulder, outside shoulders: 22"
Sleeve length, measured from shoulder: 16"
Length: Front measured from shoulder to hem: 59"
Length: Back measured from shoulder to hem: 64"
Condition: Lace has small tears throughout. 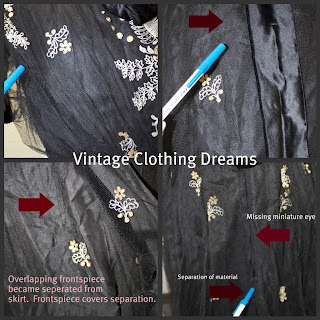 The overlay on the front of the skirt has separated from the lace underneath, but you can't see the separation unless the overlap piece is lifted. The back is missing one miniature hook (not the eye) and the portion of material underneath the hook & eye has separated a bit past the end of the opening. Interior corset is in excellent condition, minor discoloration underneath the interior armholes. If perfect gown would be priced at $1500+. Due to above condition notes, price reduced to reflect condition of gown. Shipped via Express Mail + insurance. Due to the increased problem of persons wearing/using vintage items and then returning them for full refunds, Vintage Clothing Dreams has a new policy. Please note that each item from my store now has a custom neon pink tag added to the item. The tag can easily be removed before wearing. For all my beloved English teachers that read this blog, I give you the seller's first sentence. Have fun with your red pens of doom! For everyone else, this is actually a lovely late 1900's gown. I'm thinking about 1909ish.